With Easter coming up quick we are all thinking about fun crafts and treats to make and you know me – I love Easy! 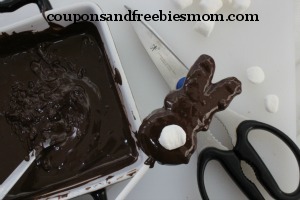 Here is an alternate way to serve those famous little marshmallow shaped bunnies! 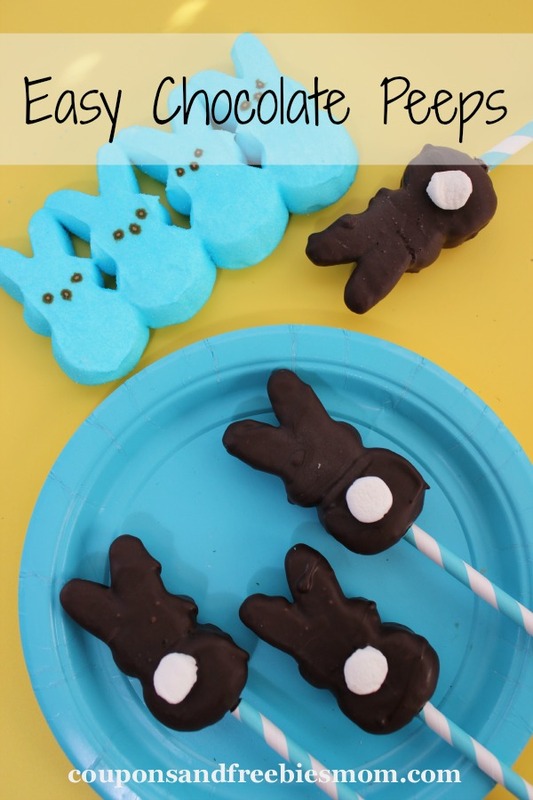 These Easy Chocolate Peeps are a great craft and treat to make with the whole family. Set up an assembly line with mini marshmallows, sprinkles and decorator icing to make each “Peep Pop” unique to its owner! Melt chocolate in microwave by heating for 30 seconds, then stirring and repeating until chocolate is melted and smooth. 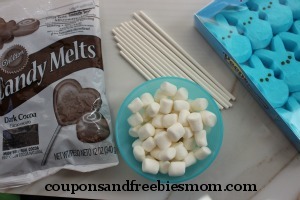 Cut each mini marshmallow in half with kitchen shears to make bunny tails. Insert stick in bottom of each bunny. Prepare a cup with something of weight in the bottom (like dry beans or rice) to keep it from tipping over. Dip and/or spoon chocolate over bunny to cover completely. Tap stick gently over bowl to allow excess to drip off. Insert bunny tail on back and place in cup. Place cup in refrigerator for 10 minutes to allow chocolate to set. These Easy Chocolate Peeps can become a super fun gift for your child’s teacher or to share with your coworkers. Grab the bunnies and chicks and dip both and arrange in a vase amongst other fun Easter themed candies for a fun “Peep Bouquet”. No matter what you choose to do, these are fun treats your kids will love and adults will enjoy too! Don’t miss out on all of our great Recipes shared here daily!